A frustrated Adam Murray has pulled the plug on a deal to bolster his Mansfield Town squad with a Premier League U21 striker before Thursday’s loans deadline. Manager Murray was angry the deal was taking so long to complete by the unnamed club and, with two crucial games ahead this Easter weekend, has decided to go with what he has. Murray said he will now go with youth from the club if needed, though stressed the loans door would not be closed for sure until the deadline had passed. Stags are seven points off the play-offs with nine games to go and Murray wanted to bring in another body with Adi Yussuf suspended for five games and Reggie Lambe missing three away on international duty. However, he said: “It’s been a frustrating hunt and it probably hasn’t gone as we’d wanted it to. 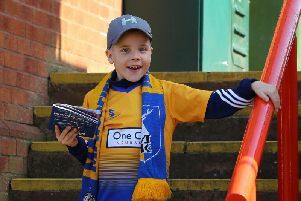 “When you are dealing with the bigger clubs obviously Mansfield Town are not in control of them and we can’t tell them how quick it needs to be done or when it needs to be done by. “So I have pulled the plug on the one we had as it was taking too long and we have too much work to do to be having people coming in last minute with the games coming thick and fast. “We’ve knocked that one on the head and we’ll go with what we’ve got. “Over the next nine games and the weeks we’ve got left training we’re probably going to have a look at our kids. “We have a couple of good U16s that we want to get involved with the first team already and the youth team boys have been flying. Murray added: “An extra body would have been a bonus but I am not going to be dictated to and held back to waste my time, the team’s time and our preparation time. “Someone coming in last minute has to fit into a squad that have been working tirelessly to put points on the board, so we move on. “We were working on it for a week and it was still no further down the line. But Murray said he would not rule out any movement until the window closes. “You never know in this game, so I am not going to say the window is shut,” he said. “ Someone might pass you another key that opens another door. You don’t know. Last week Murray brought in Chesterfield striker Mani Dieseruvwe on loan. Stags head for play-off rivals Wycombe Wanderers on Good Friday before hosting a visit of runaway leaders Northampton Town on Monday.